The Daunou Opera Hotel enjoys a prestigious location in the heart of the right bank of Paris. It offers every imaginable comfort in a quiet and sophisticated setting. 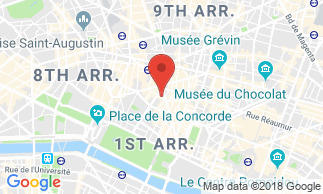 The hotel is superbly located between the Opera and Place Vendome, a few minutes from the Louvre, the Grevin Museum, the magnificent Tuileries Gardens, major department stores (Galeries Lafayette, Printemps Haussmann) and Gare Saint Lazare. It is convenient to the Olympia music hall and theatres such as Theatre De La Michodière, Theatre de Paris, Theatre de la Pépinière, Theatre Edouard VII, Theatre Daunou, Theatre des Variétés and Theatre du Gymnase. The Hotel Daunou Opera offers you Paris in all its splendour. The spacious and pleasant 50 rooms of the hotel have been completely modernized, making every effort to retain their classical charm. The blend of its decor, the mahogany period furniture, the quality of fabrics used and the perfect finishing touch provide the ideal surroundings for peace and relaxation. All rooms are equipped with the following amenities : private bathroom (bathtub, shower, toilets, hair dryer and complimentary bath products), air-conditioning, free Internet access (RJ45 cable, analogic plug or WiFi), private safe, minibar, cable television with 20 french and foreign channels, direct dial phone and private message. Triple room has 1 large bed + 1 single bed, or 3 single beds (to be precised at the reservation time). Information to travel agencies: vouchers accepted for payment. Ideally situated between the Opera House, Place Vendome and the Louvre museum, within easy reach of the famous boutiques in the Rue Saint Honoré, (Hermes, Colette, Chanel) and close to the Galeries Lafayette, the hotel Daunou Opera is the perfect starting point from which to set out and explore Paris. A breakfast buffet is served in our dining room from 7:00 am to 10:00 am. You may also enjoy a continental breakfast in your room.